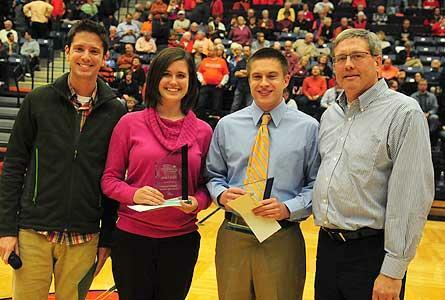 The 2012 Hope College Student Servant Award recipients were honored at halftime of the December 7 men's basketball game. Sponsored by the Center for Faithful Leadership, the students were chosen by an independent committee representing campus and community members. Alicia Curtis, a senior social work major from West Bloomfield, was a Nykerk 2015 Song Coach and works in the Events and Conference Office. She has been a volunteer mentor for teenage girls through Barnabas Ministries and has also volunteered at the Heartland of Holland Retirement home. As in the time of Shakespeare, guests gathered at the royal court for an evening of singing, dancing, feasting and general merry-making for the college's annual Madrigal Christmas Dinner. Cathy Stoel, office assistant to multiple departments in the natural and applied sciences, has been presented the Natural and Applied Sciences Division Staff Excellence Award for 2012-13 for her high level of job effectiveness and positive student and faculty interactions.